Allows double exercise on the same machine: Work the abductor and adductor muscles. The pads allow a 360.
opening angle in 7 different positions for each leg. Allows you to choose the starting position to choose between an exercise of abduction or adduction. making wider or shorter with each leg routes. Visual didactic weight indicators in 3 colors depending on the charge level scale. medium and advanced (green. yellow and red). 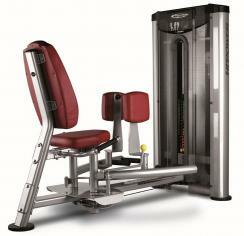 very intuitive system that helps the user to quickly identify the load and its evolution or progression in the exercise. Setting Items in yellow high contrast. Provides a quick and easy visual identification of the selectors fit for any type of user. without help from the trainer. Provides maximum user safety during the course of the year. avoiding accidents while the plates are moving. explanatory graphic Panel on the correct posture for carrying out the exercise and the muscles involved in it. Located in a position of high visibility. helps the user to identify the machine quickly and exercising properly. Using "cams" to develop a uniform weight. The cam system used in this model maintains the power arm with a constant resistance during the tour . This biomechanical improvement prevents overuse of the Golgi tendon organ. muscle tension controller. is composed of an anti-corrosion primer ensures durability of these machines. Thereafter a layer of epoxy powder and lacquer finish or varnish that gives a current aspect applies. professional and highly developed design. Fairings poly-carbonate high protection. Shockproof. They provide security against accidents. Very easy to clean. Torre plate with weight indicators in Kg and lbs. has selectors position angle arm training. Allows you to adjust the angle most appropriate training for each user, thus adapting the starting position and / or end of the year. design with lower profile and solid. For a more visually striking and elegant line. Durable design with optimized safety and comfort. Your technologically advanced biomechanical design is based on comprehensive studies of the anatomy of each muscle and behavior during exercise. Range ensures smooth and progressive exercises. and a natural motion. precise and fluid.